Super Blooper: Mario Fannin walks away after fumbling a kickoff return in the 2nd qtr. For two-and-a-half hours Saturday, as his ears rang with more Sooey Pigs than anyone expected, Auburn’s athletic director Jay Jacobs watched as the Arkansas Razorbacks served a healthy dose of 44-23 humility to the Auburn football program. Some Auburn fans who booed Jacobs after he hired 5-19 Gene Chizik to coach the Tiger football program changed their tune after a 5-0 start to 2009. Lost in the rush to celebrate the resurgence and issue calls for the college football world to apologize for thinking Chizik didn’t have the credentials to handle the task was the fact that Auburn’s first five games were, if not cupcakes, at least in the pastry family. The Arkansas Razorbacks served notice that while the rush to lynch Jacobs for the hire might have been premature, so, too, was the urge to wave the 5-0 start as a definitive case for proving the skeptics wrong. It wasn’t just that Auburn suffered its first loss under its new head coach, it was the way in which the Hogs administered the reality check. There are several things you cannot do in a football game if you expect to win. When you are playing on the road in the SEC, the checklist for victory is even more demanding than usual. 1) You can’t turn the ball over. Auburn did. The Tigers fumbled four times, losing three. All four were devastating. Arkansas scored 17 points following Auburn turnovers. In the second quarter, after Arkansas had gone up 13-0, Mario Fannin fumbled the kickoff at the Tiger 35. Three plays later, the deficit was 20. In the third, trailing 27-3 Auburn’s opening possession churned deep into Arkansas territory. Running back Ben Tate dropped a handoff at the Arkansas goal line when he would have scored easily. The Razorbacks recovered, hit a 38-yard pass on third down and went on to increase their advantage to 34-3. After Auburn clawed back into the game, reeling off a 20-7 run to close to 41-23, Tiger quarterback Chris Todd fumbled the snap on fourth down and inches. He recovered the ball but failed to convert the first down. Arkansas didn’t score, but the Razorbacks were able to bleed two minutes off the clock. On the following possession, Todd was sacked and coughed up the ball at the Tiger 10-yard line. Arkansas punched a field goal through to push the final score to 44-23. 2) You cannot give up big plays on special teams. Fannin fumbled the kickoff, leading to one Arkansas score. After Auburn had gained momentum and closed the deficit to a manageable 34-23, the Tigers surrendered a 70-yard kickoff return. Eight plays later, it was 41-23. 3) You must sustain drives. The Tigers were a miserable 4 of 14 on third downs. Auburn only had three drives that consisted of more than five plays. Five of Auburn’s 14 possessions ended in three plays or less. 4) You must keep the opposing offense off the field. Arkansas put together a 12-play drive, a 10-play march and two eight-play series. The Hogs went three and out just three times. 5) You cannot commit penalties. The Tigers were flagged eight times for 56 yards, nearly every step-off coming at the worst possible time. Arkansas got six first downs by way of penalty. Four of Arkansas’ six touchdown drives were extended by penalty. All four featured at least one pass interference call, some of which were phantom but called nonetheless. Everything that could go wrong for the Tigers did go wrong. The team was uninspired, unemotional and ill-prepared. That’s on coaching. When the trademarked “doing what we do” wasn’t working, the Auburn coaching staff seemed to have no retort, no alternate method. When doing what you do isn’t doing what you need, maybe you should do something else. Those baking dishes of crow for those who had the audacity to criticize once 5-0 Chizik had better wrap it in tinfoil and put it in the freezer. Doesn’t look like you’ll be getting to serve it for a while. Better dig out your reality recipes instead. Auburn’s defense is simply abysmal. Depth is a consideration but not enough to justify what the Razorbacks exposed Saturday. You can’t blame depth when the first string is getting abused on the opening series of the game. Chizik’s reputation as a defensive genius was tarnished by the steady decline of his defenses at Iowa State. Through five games, Auburn’s defense has been horror-movie frightening, but a steady Tiger dose of offense was able to mask the issues. When the offense struggles, as it did against Arkansas, the deficiencies are there for all to see — and mock. If you watched film on Arkansas, you knew the way to defuse the Razorback offense was to bring pressure on quarterback Ryan Mallet. Auburn defensive coordinator Ted Roof must have been watching reruns of “Gomer Pyle, USMC” in the film room instead. The Tigers brought zero heat, never rushing more than four and often sending only three. As any 8-year-old could predict, the result was Mallett torching the Tiger secondary. Eight different Hogs caught Mallett passes for a total of 274 yards. The lack of pressure also opened holes for Arkansas running backs, who generally weren’t touched until they reached the second level of Tiger defense, three or more yards down the field. Arkansas rushed for 221 total yards, with Michael Smith busting 145 of that. But it wasn’t just that Arkansas put points on the board, it was the ease with which the damage was done that was alarming. Let’s be brutally honest. Every team Auburn has played so far, including Ball State, has abused the Auburn defense at some point. The Tiger stopping unit has yet to play well enough to win a game, but the offense until Saturday was able to compensate. How do you explain the debacle that was Saturday? How does one of the nation’s best offenses (statistically) get punked by one of the nation’s worst defenses (statistically)? First, blame the defense. Your game plan changes when the hole keeps getting bigger and bigger. That is not the whole story, though. Auburn offensive coordinator Gus Malzahn appeared to have outcoached himself. Could he have wanted to win on the field of his former employer so much he stymied basic concepts that could have changed the game? It is hard to say, but something was decidedly different. Auburn scored on a few quick-strike runs in the third quarter, but the Tiger offense was never able to sustain anything on a consistent basis. After Todd took the initial snap and lost 2 yards on a screen pass, Kodi Burns took the offensive reins. Auburn fans have seen that movie before. It didn’t have a happy ending. The next time the Tigers got the ball, Auburn was down six points. False-start penalties plagued the next two Auburn possessions and Todd overthrew a wide open Terrell Zachary for what could have been an easy touchdown. Opportunity to change the dynamic of the game: missed. 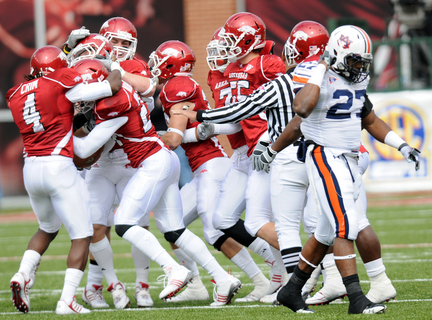 Auburn’s defense did a fairly effective job of containing the Hogs after the opening series. But as the Tiger offense continued to sputter and waste opportunities, the seams began to crack. After the third consecutive Tiger possession went nowhere, Auburn had a chance to get Arkansas off the field again, but a third-down stop was nullified by an unsportsmanlike conduct penalty on Zac Etheridge who forgot the cardinal rule: He who retaliates for getting punched in the face is the one who gets flagged. A ticky pass interference call one play later moved the ball 15 more yards and the Hogs put it in the end zone. Fannin fumbled the ensuing kickoff and the dam broke. The Tiger offense tried trickery when it should have simply punched the Hogs in the face. It tried to be things it is not, as when Todd went under center on a fourth and short and was unable to handle the snap. It never established a rhythm, never found a groove and allowed a relatively pedestrian defense to slap it around. Chizik, the king of platitudes, will likely repeat one of his standard phrases to try to put the loss in perspective. Or maybe he’ll trot out the “Every Saturday is different” cliché. Regardless of which phrase he plucks from Coach Speak Vol. 1 there is really no excuse for what transpired Saturday. Auburn did a lot of the damage to itself. It made a bad team look like a world beater. The question for the Tigers now is how to respond. Put the 5-0 start away. What Chizik does in his next six opportunities will more clearly determine whether an apology from the doubters is warranted or whether Jay Jacob’s ears will start to ring with echoes from the airport. Things were not as bad as they seemed. Every Saturday is different. But if the Tigers do not learn from this and find some way to rectify the problems exposed by an Arkansas team that, frankly, isn’t nearly as good as Auburn made them look, there could be a lot of Saturdays down the road that seem the same — and just as bad. Stop putting nutra-sweet in my koolaid. A reality check was in order and the Hogs delivered as usual. I swear I would rather play Florida every year than them. As you mentioned, everybody knew what we had to do against Mallet to rattle him, but evidently Steve Martin didn’t get the memo. With this scheme and our lack of pass rush out of our front 4, any decent quarterback will shred us. It’s still bizarro world to have a potent offense and now be worried about our defense. But honestly this game just seemed to be one of those days where everything we touched just turned to instant dog shat. It happens. And we all knew it was going to happen eventually this year. Rather it be against Arkansas than LSU or Georgia. Maybe it will help to get the whole team, coaches and players, to regain their focus. I think how we play against Kentucky will provide some answers about their character. The CBS guys seemed to say that Gus’s strategy with tempo is to wait until AFTER the first first-down to crank it up. If so, why? It sure seems like the first 3 plays could be scripted and run no-huddle. Also, Arkansas kinda proved why waiting is a bad idea – what with Auburn only getting 1 first down in the 1st quarter. The Hogs only had to face 3 up-tempo plays in the first quarter.